Summertime means fresh berries, fresh produce, hot sunny weather, beaches, and salads. This particular recipe I found in a Vegetarian Times magazine and fell in love with the flavors and the simplicity of how fast and easy the salad was to make. I did not have to tweak anything, the salad is perfect the way it is. Edamame (pronounced Ed A Ma Me) is a soy bean. Absolutely delicious steamed and sprinkled with a little salt, or boiled for 5 minutes in boiling water and then put in a salad or soup. The cranberries in this recipe give the salad a sweet flavor and the pairing with Feta cheese is excellent. The best part it is that the recipe takes about 15 minutes to make and then you can go play. Cook the Edamame in boiling salted water for about 5 minutes. Drain and rinse under cold water to stop the cooking process and pat dry with paper towels. You want to make sure the Edamame is dry so the salad is not soggy. 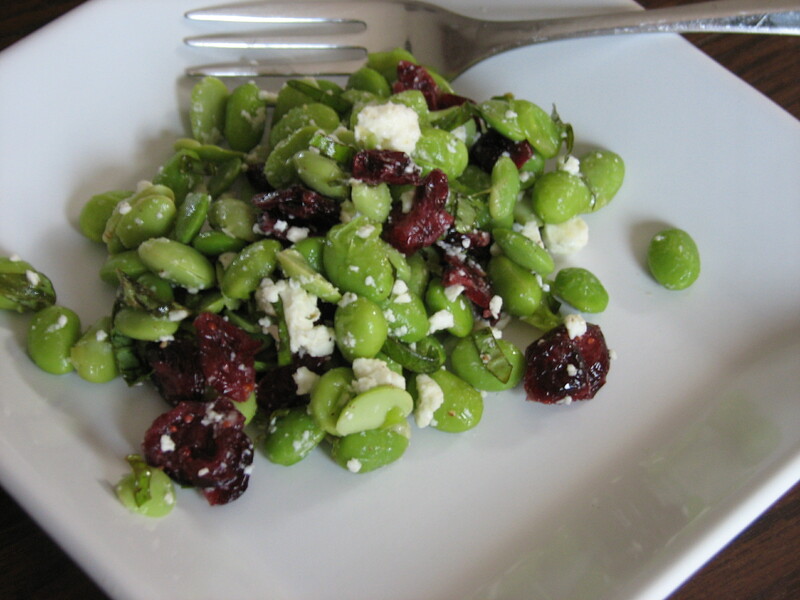 Toss Edamame with cranberries, basil, olive oil and pepper in a pretty bowl. Gently stir in the crumbled feta cheese. Serve the salad chilled or at room temperature. Serves 8 people – Enjoy! So simple, yet nutritious and good. I have also used pomegranate seeds.